This video will get your skills started off right! Includes detailed study of: Bar technique - pick technique - chimes - trills, bending strings - hammer-ons - pull-offs, slants - rhythm chops - using the cassette recorder - slow songs, fast songs - and much more. 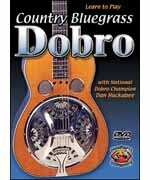 *The DVD version contains on-screen tablature one easy phrase at a time and sheet music tablature inside the package) Solos taught: Cripple Creek, Fireball Mail, Great Speckled Bird, Red Haired Boy -------------------------------------------------------------------------------- About Dan Huckabee Dan Huckabee, has a degree in Music from The University of North Texas. He won the National Dobro Championship, & has played with The Allman Brothers, Lyle Lovette, Nancy Griffith, & Robert Earl Keen Jr, just to name a few. Dan founded Musician's Worskhop in 1973, teaches Guitar, Dobro, Mandolin, & Harmony Singing at The University of Texas Informal Classes, has taught workshops & seminars at festivals all over the United States, & has authored over 250 music instructional products. So get comfortable & let Dan's lifetime of musical experience guide you through everything you need to know in the quickest & easiest way possible!